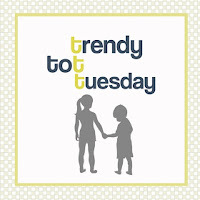 I am linking up with Megan, Kelly, and Lindsay for Trendy Tot Tuesday! I love dressing my kids in holiday clothing! There are tons of options for babies and toddlers, but it gets a bit more difficult to find clothing for school-aged kids. Dylan is basically stuck with holiday-themed T-shirts or colors now! I always photograph Lily on the table because she will actually cooperate and smile. This time, Dylan and Lexie jumped up to join her! Lily wore the same outfit that she wore last year. It's 6-9 months, but it was too cute not to wear again, so I stuffed her into it! Lexie had a tutu on, but she spilled something on it before I could take pictures! That's life with kids! My sweet little man is getting so big! Lily is so cute in that green tutu. I love all their outfits! WHAT??? Baby #4??? I so have some backtracking to do. LOVE your little's pigtails! too cute! Hi Stefanie! I popped over from Amy's blog and just wanted to say hi :) You have such adorable kids and congratulations on baby #4 arriving this year!!! I started following you on Instagram last week incase you were wondering who the random stranger was...not a stalker lol just a mutual bloggy friend with Amy and Tracey and Melissa and I think loads more too! So cute! Love the tutu! Perfect outfits! I love how adorable Lily looks! I LOVE that you are always able to get pictures of all three - that is awesome! Love their outfits!